Presently there is a variety of smartphones to choose from in the market. The blessing is that you can get the best in any price range you mention, even if it is Samsung. The price of Samsung Galaxy On7 Pro is INR. 7490. The smartphone is user-friendly and offers updated features with optimum utility. The features and specifications of the Samsung Galaxy On7 Pro are pretty impressive. What’s eye-catching about this device is its camera. The main shooter has 13 Megapixel power while the front shooter is 5 Megapixel. The features of the camera have made it so much easier to click pictures. You get to click wide-angle (up to 120 degrees) photos for selfies. It also responds to palm gestures for clicking pictures. The specifications of Samsung Galaxy On7 Pro include a powerful battery of 3000mAh capacity. Also, the battery is removable and it has the capability to run the device for long hours. The processor of the phone is a Quad-core chipset of Qualcomm Snapdragon. The processor works at 1.2GHz speed and it is tagged along with 2GB RAM. For your apps, multimedia files, and data, the phone houses 16GB internal storage expandable up to 128GB. When it comes to connectivity, the dual-SIM device supports 4G VoLTE network, so you have no concerns when it comes to internet speed. The device also supports Bluetooth v4.0 and USB 2.0. Another feature you get on this device is the Smart Sync which can be used to connect and synchronize your data on your computer in an easier and faster way. The Samsung Galaxy On7 Pro’s display is a 5.5-inch unit. The display surely has impressive clarity and colors with 16M color depth to it. The quality of the display is also very evident through the FHD clarity and video playing of 1920 x 1080 resolution at 30fps. The aesthetics of the device are designed to make it robust. Unlike many other devices, the back of the Galaxy On7 Pro is given a physical texture to avoid any scratches or physical damages to the device. The device is very easy to handle and carry around, as it is 8.2mm thin. 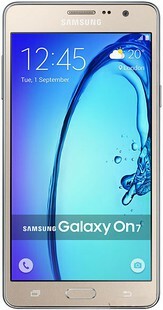 You can buy a Samsung Galaxy On7 Pro in a simple Black or a trendy Gold color. Either way, the phone looks classy and simple. The Samsung Galaxy On7 Pro is an amazing pick and pretty reasonable for its price. You will not be disappointed with its camera and display. It also your budget-friendly savior if you happen to be clumsy with your mobile phones. However, the only reason to avoid this phone is that you get Android Marshmallow instead of Android Nougat. But otherwise, the Samsung Galaxy On7 Pro is a brilliant choice. Samsung Galaxy On7 Pro full specs and reviews as of Apr 2019. Buy it here!